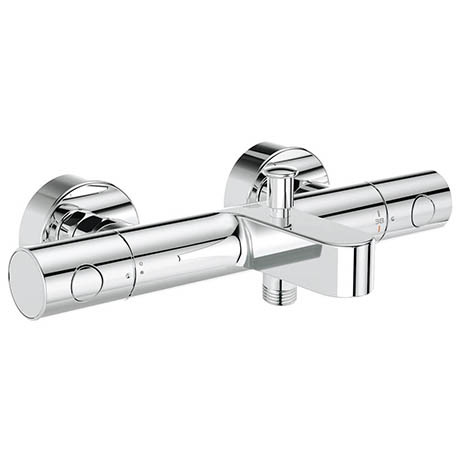 This Grohtherm 1000 Cosmopolitan M Thermostatic Bath Shower Mixer is safe and ergonomic and great value for money. It benefits from GROHE TurboStat technology, your water temperature stays constant, regardless of any fluctuations in your water supply or water pressure. The easy to grip controls can always be adjusted effortlessly, even with soapy hands. The integrated SafeStop Plus system comes with a two-stage temperature limit. The first limit is preset at 38°C. If desired, temperatures of up to 43°C can be selected upon deactivating the SafeStop button. With GROHE EcoJoy® technology, you can indulge in a perfectly comfortable shower or bath while reducing water consumption.